Just when we thought we'd seen it all, a photo of a woman whose swollen, overgrown gums look just like strawberries surfaced on the interwebs. A rare manifestation of a very rare disease caused the 42-year-old's gums to appear red, puffy, and granular. You have to see it to believe it—but don't worry, there's a photo below. A case report in the New England Journal of Medicine (NEJM), which was published in 2017 but recently started going viral again, tells us the Iranian woman went to the dermatologist complaining of a strange mix of symptoms. She had been experiencing a painful case of gum overgrowth for about six weeks as well as recurrent nosebleeds and necrotic ulcers on her face (meaning her skin cells were dying). 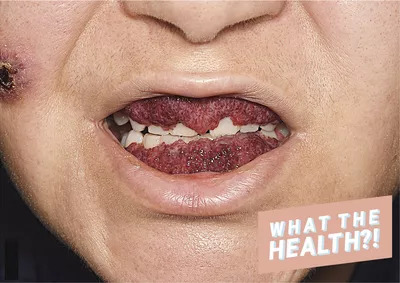 Gum overgrowth itself is called gingival hyperplasia, but when it has a "granular and hemorrhagic appearance" (as the author of the case report puts it), it's called strawberry gingivitis. Gingival hyperplasia can be caused by four things, Sally Cram, DDS, a Washington D.C. periodontist and spokesperson for the American Dental Association, tells Health. The first, and most common, is poor oral hygiene. It can also be caused by certain medications (such as drugs that prevent seizures or those that lower blood pressure), genetics, or underlying medical conditions. Strawberry gingivitis is actually a rare manifestation of an also rare vascular disease, Cram says. The disease, which the woman in this case was indeed diagnosed with, is called granulomatosis with polyangiitis. It's a condition that causes inflammation of the blood vessels. The woman was diagnosed not only because of the symptoms mentioned above, but also because doctors found certain antibodies in her system as well as multiple growths (called pulmonary nodules) in her lungs. Doctors treated the woman with a medication to suppress her immune system called cyclophosphamide, which is also sometimes used to treat cancer, as well as a steroid called prednisolone, used to treat inflammation. Unfortunately, doctors didn't hear from the woman after she began treatment, so they can't be sure what came of her case. Cram says gingival hyperplasia often subsides after the underlying cause is treated or changed. For those who have gingival hyperplasia because of genetics, the condition can usually be managed by being extra hygienic. In severe cases, the gums can also be trimmed back, she adds. If you notice anything out of the ordinary happening with your gums, it's important you see a dentist or doctor as soon as possible. Cram says the earlier you catch it, the better it can be treated.